What Are the Nine Sacred Woods of a Bonfire? Use these nine sacred woods in ritual bonfires. In many Wicca-based traditions, nine sacred woods are incorporated into ritual fires. These nine woods are based on the first nine trees in the Celtic tree calendar, and are listed in a long-form version of the Wiccan Rede. 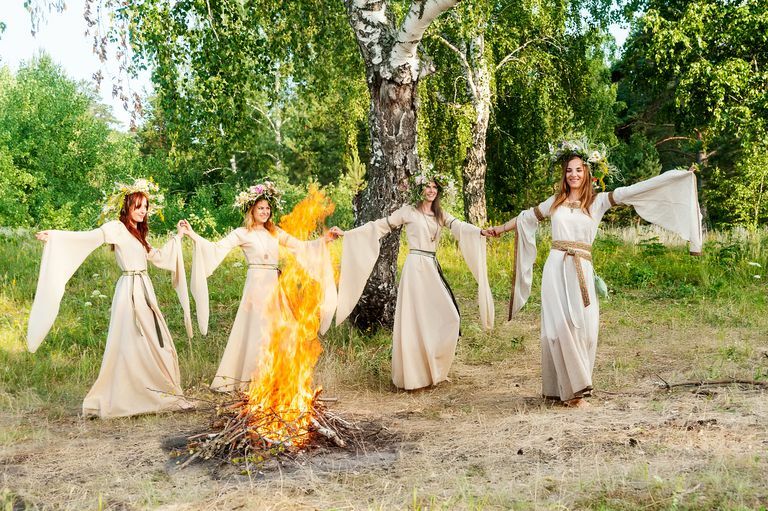 In particular, many Wiccan traditions use the nine sacred woods to build a Beltane fire or Bael Fire. Although you don't have to follow this list to build a bonfire–and certainly, it may be hard to find some of these woods, depending on where you live–you can use this list as a framework for your ritual fire. Keep in mind that this list may not be applicable to everyone - it's going to vary based upon your tradition's guidelines and your location. When a forested area burns, Birch is the first tree to grow back, and thus is associated with rebirth and regeneration. Workings using Birch add momentum and a bit of extra "oomph" to new endeavors. The Birch is also associated with magic done for creativity and fertility, as well as healing and protection. It is the first month in the Celtic tree calendar, following the Winter Solstice, and is related to the Ogham symbol Beith. Use Birch branches to craft your own besom for magical workings, and in spells and rituals related to enchantments, renewal, purification, fresh starts and new beginnings. "As one of the first trees to put on her spring-dress it is only natural that the Birch has always been associated with the life giving force and has thus featured prominently in all manner of fertility rites and magic. Birch signals the arrival of spring and traditionally farmers have observed her progress as an indicator to sowing their wheat." Known by the Celts as the Ogham symbol Luis (pronounced loush), the Rowan is associated with astral travel, personal power, and success. A charm carved into a bit of a Rowan twig will protect the wearer from harm. The Norsemen were known to have used Rowan branches as rune staves of protection. In some countries, Rowan is planted in graveyards to prevent the dead from lingering around too long. Rowan is also associated with the Celtic hearth goddess Brighid. "Twigs tied in a cross with red thread are affixed to doors and barns to keep the inhabitants and livestock from being enchanted, saying this charm, ‘Rowan tree and red thread, will put witches to their speed.’ Walking sticks made of rowan are used to protect the user from the spirits of the woods." In Norse lore, Odin hung from Yggdrasil, the World Tree, for nine days and nights so that he might be granted wisdom. Yggdrasil was an ash tree, and since the time of Odin's ordeal, the ash has often been associated with divination and knowledge. In some Celtic legends, it is also seen as a tree sacred to the god Lugh, who is celebrated at Lughnasadh. Because of its close association not only with the Divine but with knowledge, Ash can be worked with for any number of spells, rituals, and other workings. Associated with ocean rituals, magical potency, prophetic dreams and spiritual journeys, the Ash can be used for making magical (and mundane) tools–these are said to be more productive than tools made from other wood. Use an Ash branch to make a magical staff, broom or wand. The Ash also appears in the Ogham as Nion. The Alder is associated with making spiritual decisions, magic relating to prophecy and divination, and getting in touch with your own intuitive processes and abilities. Alder flowers and twigs are known as charms to be used in Faerie magic. Whistles were once made out of Alder shoots to call upon Air spirits, so it's an ideal wood for making a pipe or flute if you're musically inclined. The Alder represents the evolving spirit, and is represented by the Ogham symbol Fearn. A Willow planted near your home will help ward away danger, particularly the type that stems from natural disaster such as flooding or storms. They offer protection, and are often found planted near cemeteries. In addition to its use as a healing herb, Willow was also harvested for wicker work. Baskets, small curricles, and even bee hives were constructed with this bendable, flexible wood. This wood is related to healing, growth of knowledge, nurturing and women's mysteries, and is represented by the Celtic Ogham symbol Saille. The Hawthorn is associated with magic related to masculine power, business decisions, making professional connections. The Hawthorn is also associated with the realm of Faerie, and when the Hawthorn grows in tandem with an Ash and Oak, it is said to attract the Fae. This prickly-thorned tree is associated with cleansing, protection and defense. Tie a thorn with a red ribbon and use it as a protective amulet in your home, or place a bundle of thorns under a baby's crib to keep bad energy away. It is represented by the Celtic Ogham symbol Huath. The mighty Oak is strong, powerful, and typically towering over all of its neighbors. The Oak King rules over the summer months, and this tree was sacred to the Druids. The Celts called this month Duir, which some scholars believe to mean "door," the root word of "Druid." The Oak is connected with spells for protection and strength, fertility, money and success, and good fortune. The ancients used the wood of the Holly in the construction of weapons, but also in protective magic. Hang a sprig of Holly in your house to ensure good luck and safety to your family. Wear as a charm, or make Holly Water by soaking leaves overnight in spring water under a full moon. In the pre-Christian British Isles, the Holly was often associated with protection; planting a hedge around your home would keep malevolent spirits out, thanks in no small part to the sharp spikes on the leaves. In Celtic myth, the concept of the Holly King and the Oak King symbolizes the changing of the seasons, and the transition of the earth from the growing time to the dying season. Holly is represented by the Ogham symbol Tinne. Hazel is often associated in Celtic lore with sacred wells and magical springs containing the salmon of knowledge. This is a good month to do workings related to wisdom and knowledge, dowsing and divination, and dream journeys. Hazel was a handy tree to have around. It was used by many English pilgrims to make staffs for use upon the road. Not only was it a sturdy walking stick, it also provided a modicum of self-defense for weary travelers. Certainly, it could have been used as well for ritual. Hazel was used in weaving of baskets by medieval folk, and the leaves were fed to cattle because it was believed this would increase the cow's supply of milk. It is represented by the Celtic Ogham symbol Coll. "Burn it Not Or Cursed You'll Be"
If you follow one of the many forms of Wicca that adheres to the Rede, you may want to heed this warning and avoid burning Elder in your ritual bonfire! Obviously, if your tradition does not follow the Rede, you can overlook this guideline.